Being smack bang in the middle of the pacific and surrounded by ocean, Kiribati really is the tropical island with clear blue water, coconut trees, hot weather and sandy beaches. Of course this is how I describe Kiribati to all my friends and I admittedly lead them to believe that it is paradise on earth. Call me biased but the islands really are a sight to see. However, for a while now, Tarawa (the main island/capital) has become over-populated and polluted with junk being thrown in the ocean and of course people having a nice old poo in the water. When I was last in Kiribati with my family, we used to play a game as we drove along the causeway. If we saw people standing in the ocean, we would try and guess whether they were pooing or fishing. 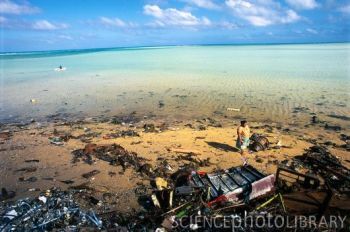 Anyway, this is the side of Kiribati that is never shown and what is most shocking to visitors. There is so much stuff that is delivered to the island and yet is not taken off it and due to lack of education, the local people just throw the rubbish in the sea. Shocking as that is, for so many years, no one was telling them otherwise and therefore the water – although clear and gorgeous – is incredibly polluted and full bacteria. So much so that I never swim in the lagoon when I’m there, it’s always in the ocean – I’m all for good digestive systems but I’ll pass on the diarrhea thanks. Consider this a warning to anyone that is planning to head out there – swim in the moving water or be prepared to see a poo float past! 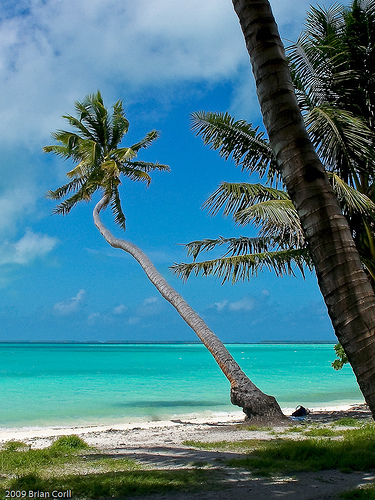 Admittedly I haven’t been to Kiribati for a couple of years now (in March fingers crossed!) but ever since I’ve been going there, the state of the island has gotten worse. Actually, when I was there in 2007 it had gotten better in terms of litter being dispersed on the island but the amount of shipping containers piled up on top of each other had risen. The most awful and gut wrenching thing I saw was seeing my Grandma live in a traditional Maneaba/meeting house (pictured) surrounded by shipping containers piled 3 times high. What was even worse was that everyone that lived in between the containers thought nothing of it – they had become to accustomed to living in between these huge containers. People talk about lightbulb moments and I guess you could say this was mine. At that moment, I realised how much of an Islander I am and yet how unconnected to the country I am. I felt helpless and responsible at the same time. However, before I starting banging on about emotions, I have some good news to share! Only last week, The World Bank has pledged $2m (US) in emergency food aid to the outer islands of Kiribati. You can read the article on the BBC website here The outer islands are tiny and will no doubt benefit from the imported food. 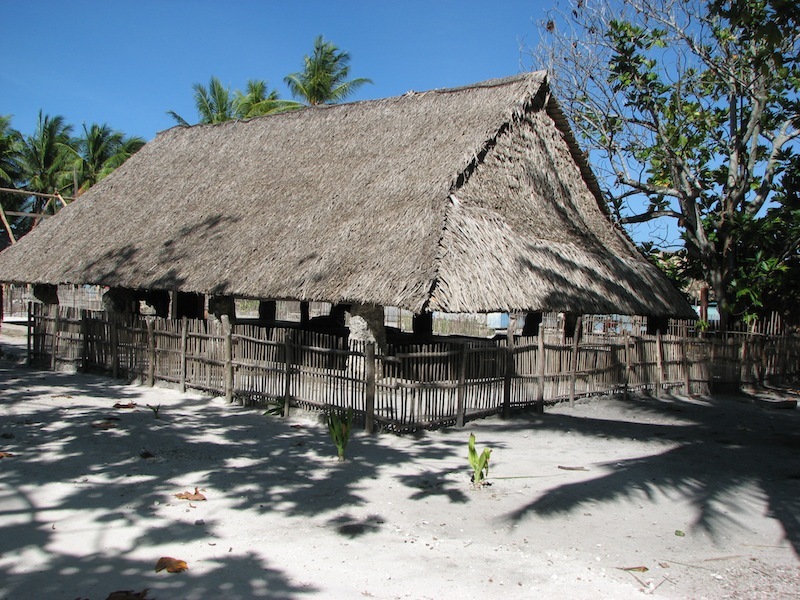 Kiribati diets are pretty much fish, rice and coconuts. However, it does make me wonder how the hell they are going to get the rubbish/packaging off the island. Tarawa is packed with aluminium cans, chip packets and plastic containers. I’m sure that people out there think of this and I’m sure they have certain procedures to follow to get rid of waster on the island but until those shipping containers are moved from my Grandma’s maneaba, I’m going to keep whingeing. I don’t know the answer – ecofriendly packaging? Recyclable packaging? I wish. The islands definitely do need to spend more money on education – but again, this is an island that is pretty much third world. What a bloody catch 22!